The Western Wall refers not only to the exposed section facing a large plaza in the Jewish Quarter, but also to the sections concealed behind structures running along the whole length of the Temple Mount, such as the Little Western Wall–a 25 ft (8 m) section in the Muslim Quarter. The Foundation Stone, the most sacred place is easily accessible. In the past it was the only part of the Temple area from which they were almost always excluded. Nowadays pious Jews do not go up on to the Temple Mount, as they are now able to do, since the position of the Holy of Holies, which could be entered only by the high priests, is not known. In ancient times there was a shallow valley called the Tyropaean running along the Western side of the Temple Mount (now filled in due to constant demolition and rebuilding) that separated the rich Herodian quarter from the Temple, and it was the need to bridge this that cause the arches to be built. These pathways still hold up the streets today, and the tunnel goes directly underneath the Muslim quarter. The famous sites here are, Western Wall Plaza, It is the major sacred place for the Jews built by Herod the Great at the complex of Temple Mount. Barclay’s Gate, It is a massive gate located to the right and on the top of fill stones. The original gateway is still preserved. Largest Stone, It is the largest path of stones that is visible from the southern and western sides of the wall. Wilson’s Arch, It is the prayer area for the men that continue from the outdoors. 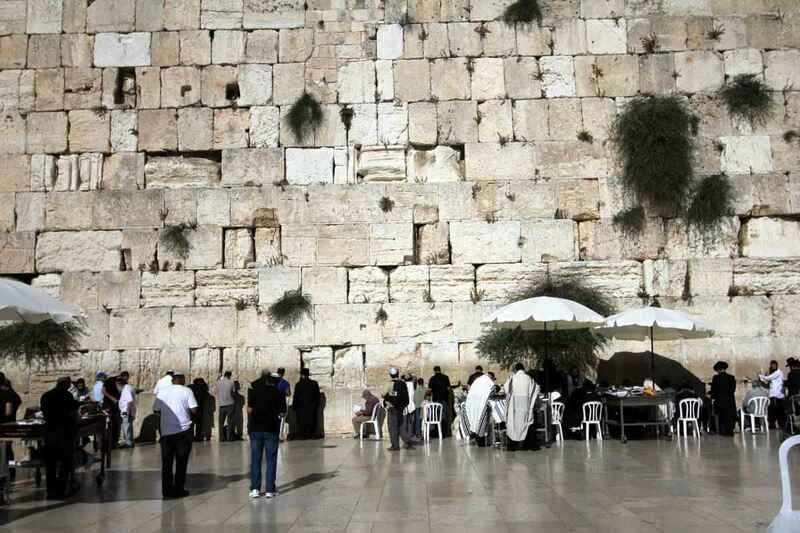 It is the most holy place for the Jews and the Jewish people offers prayers thrice in a day. The prayers are held on mornings, afternoons and evenings and the people tie their forehead with phylacteries and cover themselves with white shawls.